Q: How can I efficiently mount more than one XJ-300FR into a rack? A: It is important to note that although the xj300fr is extremely efficient and can be put in a packed rack with components on all sides, those components must be passive and a maximum of two xj300fr should be used in the same rack if packed densely and with no forced cooling. 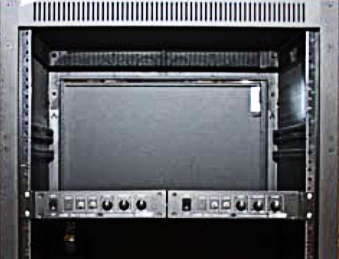 For an installation comprising several Xj300fr in one rack they should be clicked together and then in pairs be mounted with 1 rack U space in between. The space in between should use a perforated front plate or no plate at all. . Any other rackspace not being occupied should have a non perforated blocker plate in them. For 8 amps configured in this way there should be 100CFM of laminar front to back forced airflow. The amps auto on feature turns them on when they see more than 22mv of input, with a line level nominally being 0.77volts they are extremely sensitive.